Watching Robin Van Persie limp on crutches after United’s clash with Swansea City towards the end of February was a dismal sight for fans and management alike. It seemed to be a blow to an already struggling Manchester United attack. The Dutchman’s injury has forced Louis van Gaal to continue tweaking the formation in search of that elusive best fit. United fans have seen several different and unsuccessful strike partnerships this season. 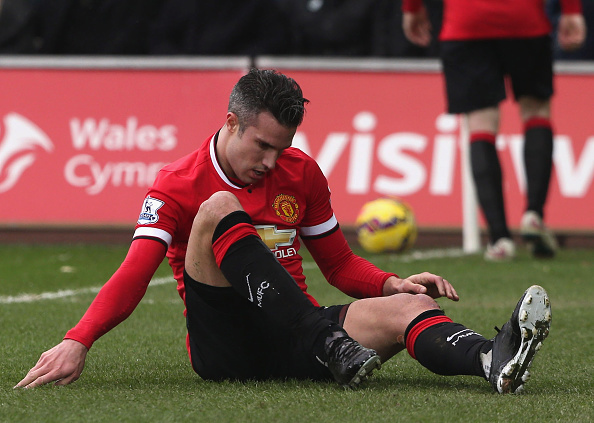 Ironically enough, an injured Van Persie seems to be able to put an end to this inconsistency in attack. In the immediate aftermath of Van Persie’s misfortune, Louis van Gaal seems to have heeded fans’ desperate pleas and reinstated Wayne Rooney’s role as the principal striker at the helm of the Manchester United attack. Following the Swansea game, Van Gaal started Rooney upfront in partnership with Radamel Falcao when the Red Devils hosted Sunderland at Old Trafford. A game the home side won 2-0. Following the Sunderland game, Wayne Rooney started as the lone striker upfront in United’s midweek travel to Newcastle United. The rejig in formation was not just restricted to Rooney’s role in the team. Van Gaal finally mustered the courage to drop big names when they fail to deliver. Rooney’s promotion coincided with Falcao’s demotion to the bench. It seems the Colombian has run out of lives at Old Trafford. Van Persie has not had a good season so far. His inclusion in the squad is often attributed to his close relationship with the manager rather than his performances. With 10 goals in the 24 games that he has started, the Dutchman’s stats do not make for good reading, especially if you are a Manchester United fan. Saying that the pressure on him to deliver is huge would be a grave understatement. His performance against Swansea was testament to his poor form. Amongst the 7 shots which Van Persie took against the Swans, only one was on target. This injury will gift him some much needed time away from the spotlight in order to find his form. During a time when fans are questioning Falcao’s future next season, many are tempted to declare that Van Persie, too, is way past his prime. After scoring 56 goals in the past two seasons, he has looked off colour in the current campaign. His failed partnership with Radamel Falcao has forced the manager to try Angel Di Maria, a world class winger known for his blistering pace and wing-play, in the capacity of a striker. Unsurprisingly, the Argentine failed upfront due to lack of space and service. The game against Newcastle might not have displayed the much desired fluidity in attack, but saw many offensive players start in their conventional positions including Di Maria and Rooney. It might be a good time to point out that this never happened with Van Persie on the pitch. If Van Gaal decides to be consistent with his squad decisions, the line up against Newcastle should go on to bring back the flair into the Manchester United attack. In all likelihood, Rooney will continue starting up front, Di Maria will dominate the flanks, Mata or Fellaini will dictate midfield play with Herrera supporting their every move. Young James Wilson might also get a look in. Robin Van Persie might return from injury into a familiar role – next to skipper Wayne Rooney in attack. Van Persie has successfully combined with Rooney during his time under Sir Alex and David Moyes. Van Gaal’s insistence on him teaming up with Falcao has not been a fruitful endeavour so far. Falcao’s form has piled all the pressure on Van Persie, who is expected to compensate for the Colombian’s incompetence. With Rooney alongside, Van Persie will play rest assured that the captain will support him during periods of poor form. If history has taught us anything it is that Van Persie has thrived in teams which were built around him. Louis Van Gaal should do just that to bring out the best in the Dutchman. Lack of chances due to poor service has forced him to sometimes try and score spectacular goals out of nothing. A steady midfield formation and Rooney in support will restore his confidence. The Robin Van Persie introduced to Manchester United by Sir Alex Ferguson is not extinct, just dormant. Last 5 players to score a Premier League hat-trick for Manchester United: Where are they now?